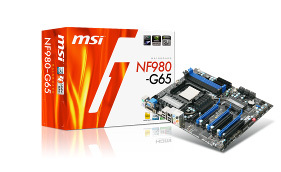 MSI today released two of its gaming AMD based mainboards – NF750-G55 and NF980-G65. The NF750-G55 not only supports AM3 CPU and DDR3 memory, but also provides SLI multi-GPU technology to easily boost the efficiency of 3 dimensional effects. Through several MSI exclusive technologies, such as Active Phase Switching (APS), Easy OC Switch, M-Flash etc, NF750-G55 is definitely the best value-for-money choice of game platform. MSI exclusive APS smart power saving design is applied to NF750-G55 and is able to automatically adjust power supply based on system power loading. Unnecessary power consumption will be effectively reduced to save money for consumers. 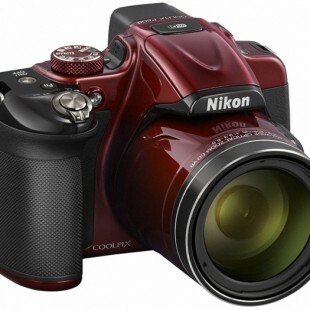 NF750-G55 provides you good graphics performance, in the meantime looks after consumer’s wallet as well. For overclocking function, besides standard BIOS options, NF750-G55 equips MSI exclusive Easy OC Switch. CPU performance can be easily increased by turning on the switch. No complicated BIOS setup is needed. 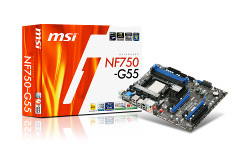 In order to provide consumers convenient BIOS upgrade and backup, MSI implemented unique M-Flash BIOS advanced backup function into NF750-G55. Consumers can upgrade and backup BIOS via USB flash in ease. When system BIOS goes wrong, through M-Flash, system BIOS can be rebooted and restored by using flash disc to secure consumers’ data. NF750-G55 is built-in high definition HDMI and DVI output to satisfy consumers’ audio needs. Blu-ray sound effect chip is adopted to provide 7.1 surround sound high definition output. Comparing with ordinary 7.1 surround sound chip, the sound chip built-in NF750-G55 can provide higher quality sound effect when enjoying Blu-ray movies. To fulfill consumers’ 3D effect requirement, NF750-G55 was built-in two PCI-E x16 slots to support NVIDIA SLI multi-graphic technology. When consumers insert the same model of graphics cards on NF750-G55, great 3D effect can be performed especially when playing heavy loading games. The NF980-G65 with NVIDIA nForce 980a chipset which supports not only AMD latest Phenom™ II AM3 processor as well as DDR3 memory, but also 3-way SLI processing by additional NF200 controlling chip in order to enhance the expanding capacity of mainboard. In addition, NF980-G65 is equipped with MSI exclusive design, such as APS(Active Phase Switching), Easy OC Switch and True Blue-ray audio, presently the best option to optimize your AMD gaming performance. MSI NF980-G65 equipped with MSI exclusive APS technology, is very user-friendly design featured as energy-saving and economical price. Based on system loading, active processor power switching effectively decreases unnecessary energy consumption to attain the purpose of optimizing power-using. Besides, MSI NF980-G65 also supports Easy OC Switch technology, which enables users to revive the potential of processor by easy switch instead of understanding those complicated BIOS configuration. Meanwhile, to satisfy those gamers who need to upgrade their 3D performance, NF980-G65 added up a NF200 controlling chip, to supply sufficient bandwidth for 3-Way SLI processing. Consumers can decide 1~3 pairing combination based on their different demand to reach different 3D performance, which is an un-expendable function for ultimate performance. To reach the demand of multimedia, MSI NF980-G65 not only supports HDMI+DVI output but builds in true blue-ray audio premium 7.1 channel audio chip. With outstanding audio performance in regular games, it overpowers ordinary 7.1 channel audio chip with simply 2.1 standard. With true blue audio technology, it delivers perfect audio performance to let the audience to experience the vivid vision and sound.